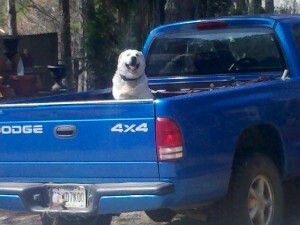 It’s true what they say, two-footed friends–dogs love trucks! I was with writer-gurrl at the garden center recently when we spotted this happy guy waiting in the bed of a pickup truck. The kind of Hair Ball we’re talking about here is NOT the stuff you pick off your sofa and your best pair of black pants. No, no, no. We’re talking about a party sponsored by Angels Among Us Pet Resuce! 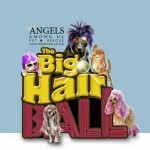 Come on out for the Big Hair Ball! No hair is required to enter this event! There’s a cocktail hour and silent auction from 6:00 to 7:00 PM, followed by dinner and dancing. 80’s attire and/or Black Tie attire are optional. This is for such a good cause! The money raised at the Big Hair Ball will go to help homeless pets, like I once was. Your donations will buy food and medicines and provide shelter for rescued and orphaned dogs, cats, and other animals. We really need your help–and if you’ll take us home, we’ll give you so much in return. We’ll love you forever, and you’ll know you’ve helped some of God’s creatures. So what are you waiting for? Click here: Great Big Hair Ball to find out more. Then break out your leg warmers and parachute pants, mini-skirts and shoulder pads, and come on out for a good cause. You’ll make us smile, even if we don’t have a truck to ride around in! I have four Spaniels myself and really enjoyed your post.